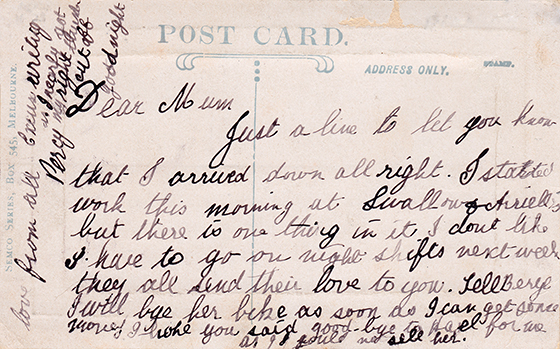 This postcard was found by one of the PMHPS founding members at a Postcard swap meet. A simple old postcard, but what a story it tells. On the front is a photo of the State School Port Melbourne and on the back is a letter from Percy to his mother. It is one of the Semco Series of postcards, dating from the early 1900s, which illustrate schools, civic buildings and country towns mostly as framed pictures. The front shows a large group of children coming out of the rear of the school, later known as the girls yard, at the Port Melbourne Primary School. Was this photo taken for a special occasion? We don’t know. Sandridge/ Port Melbourne (Nott Street) State School number 1427 was built in 1874 after the introduction of the Education Act of 1872, which established free, compulsory and secular education in Victoria. Prior to this there were several church and a National school in Sandridge. They charged fees, were poorly attended and inadequately staffed and equipped. Nott Street School was built to accommodate 800 to 1000 students. By 1889 it was so overcrowded that an annexe had to be built in Graham Street for the students on the other side of the railway line. 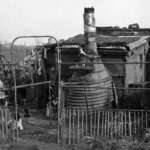 Overcrowding and inadequate funding for maintenance continued to be a problem. By 1908 the grade 7 and 8 children had to be accommodated in the Presbyterian Hall. The citizens of Port Melbourne have always displayed an intense interest and pride in their school and it seems to be a tradition to have City Councillors on the Committee. …. 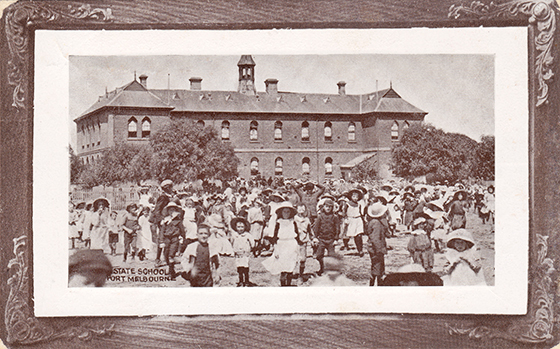 The Combined Port Melbourne Schools’ and Citizens’ Annual Picnic, held every year for 48 years from 1904 till 1952, was an occasion when special trains were chartered and local shops closed to bring together pupils of Nott Street, Graham Street and St Joseph’s schools. In 1908 Nott Street Primary and Graham Street Primary Schools became separate identities. In 1992 Nott Street Primary School was closed and most Port Melbourne students were enrolled at Graham Street. In 2000 Graham Street School became Port Melbourne Primary School. The old school in Nott Street has had a facelift and a change of name and focus. 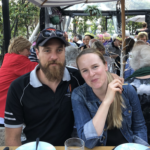 It is now the Port Phillip Specialist School, which caters for students with mild, moderate and severe intellectual disabilities including autism, genetic and physical disorders. Unfortunately there is no date or address on the letter from Percy to his Mother so we don’t know where it was sent or when he came to Port to work for Swallow and Ariell, Australia’s first and largest biscuit factory founded in 1854. We don’t know what part of the factory he worked in. Was it making biscuits or cakes, puddings, ice cream, or fruit or vegetable preserving? Or did he work with the machinery, maintenance or packing? How did he manage on the night shift and did he buy a bike for Beryl? We will never know the answers. But it is nice to know that this postcard sent from Port has come back to Port and to the PMHPS collection, donated by a member who lives opposite Swallow and Ariell factory. Bride, M & G, 2013. The Borough and its People. Port Melbourne, Port Melbourne Historical and Preservation Society. Postcards from Port. An audiovisual retrospective of Port Melbourne. DVD. 2014. Jolly Good Films. PMHPS. My grandmother completed her teacher training at School No. 1427 in 1901. She had just married, her training done in the name of Mary Russell and her certificate issued to Mary Mercovich.